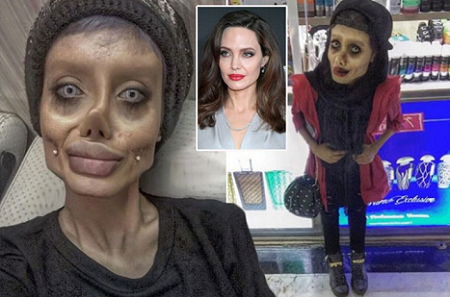 Do You Know The Girl Who Trended After She Did ‘Surgeries’ To Look Like Angelina Jolie Faked It? A teen who claimed she had '50 surgeries' to make her look like Angelina Jolie has admitted it was all a lie. Sahar Tabar came clean after photo experts accused her of creating the pictures with photoshop, after spotting blurring in the background of her pictures. The 19-year-old explained that she created the “corpse bride” look through Photoshop and makeup effects. She told Sputnik : “Now I can see that I have something in common with (Angelina Jolie), but I amuse myself, and to look like someone is not my goal. Showcasing skeletal cheeks and a pointy nose, in one photo she covered her brown eyes with shocking white contacts, as she pouts her plumped-up lips for the camera. And now she says it’s all fake! 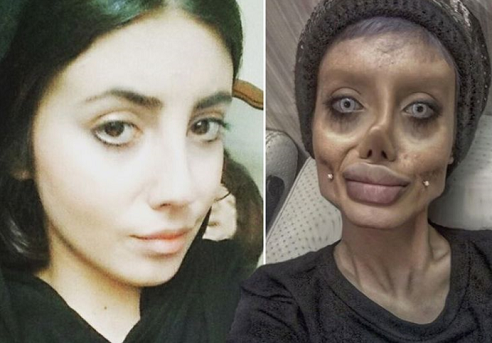 » Do You Know The Girl Who Trended After She Did ‘Surgeries’ To Look Like Angelina Jolie Faked It?